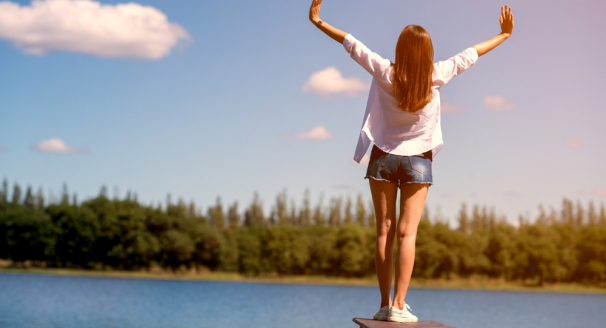 Although a wine bottle's primary purpose is to hold wine, there are actually many other ways you can use them once they are empty. As wine bottles come in different shapes, sizes and colors, they open up a magnitude of creative possibilities. 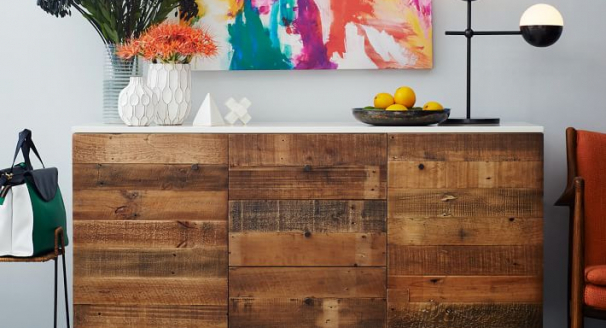 From a decorative piece in your home to a beautiful and functional candle holder, we list 20 of the different ways you can easily upcycle and repurpose wine bottles at home. 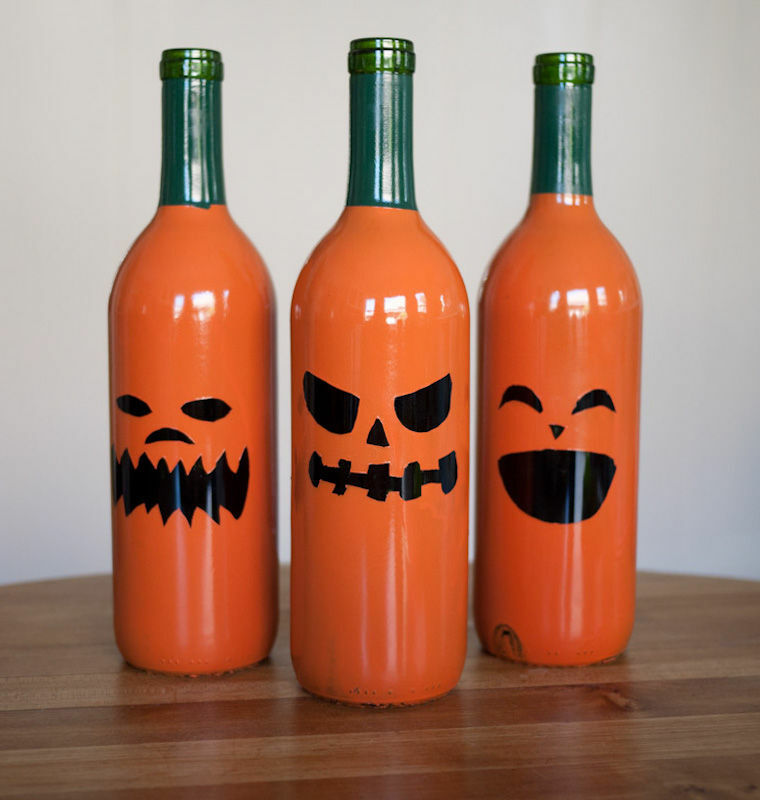 Save yourself the stress of pumpkin carving and create spooky halloween decorations by painting your wine bottles to look like jack o' lanterns. 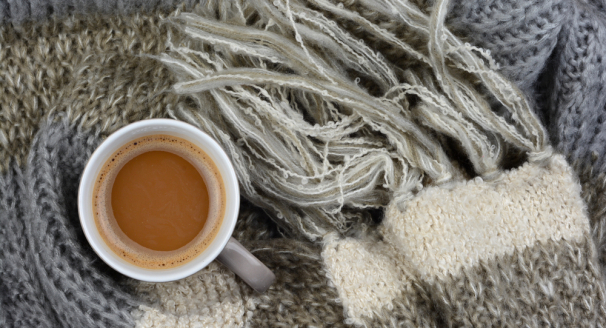 You only need orange spray paint, a sharpie and a few other materials to create this fun design. Alternatively you can use white spray paint and make your bottles look like ghosts. 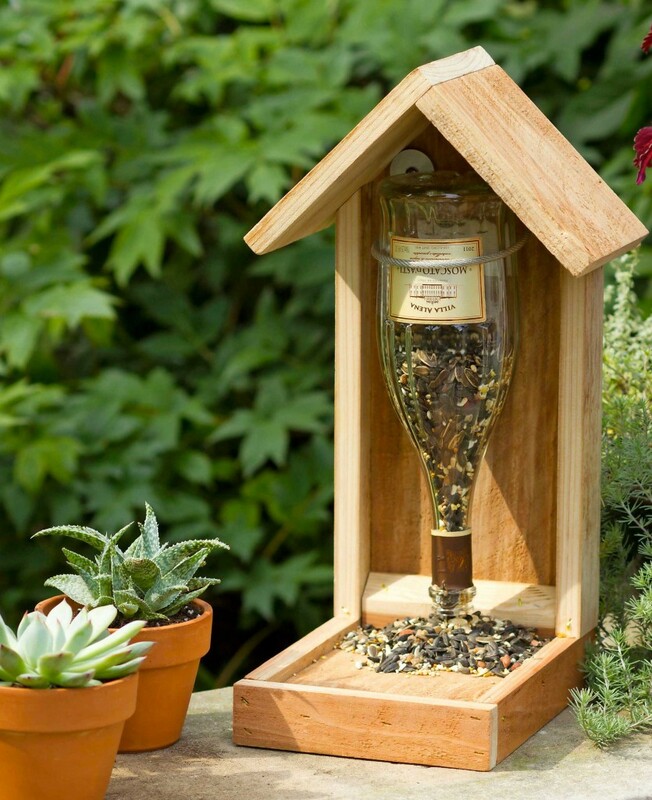 Make your garden more bird-friendly by turning an empty wine bottle into a handy bird feeder for your yard. 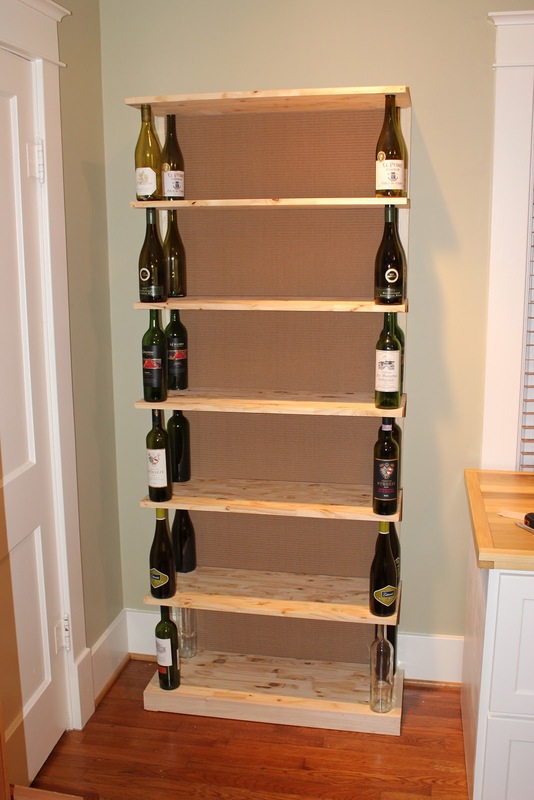 This is a very easy project which only requires some scraps of wood, a wine bottle and a couple of tools. Once it's finished you can gaze out into the yard and watch the birds perch on your feeder and enjoy a nutritious meal. 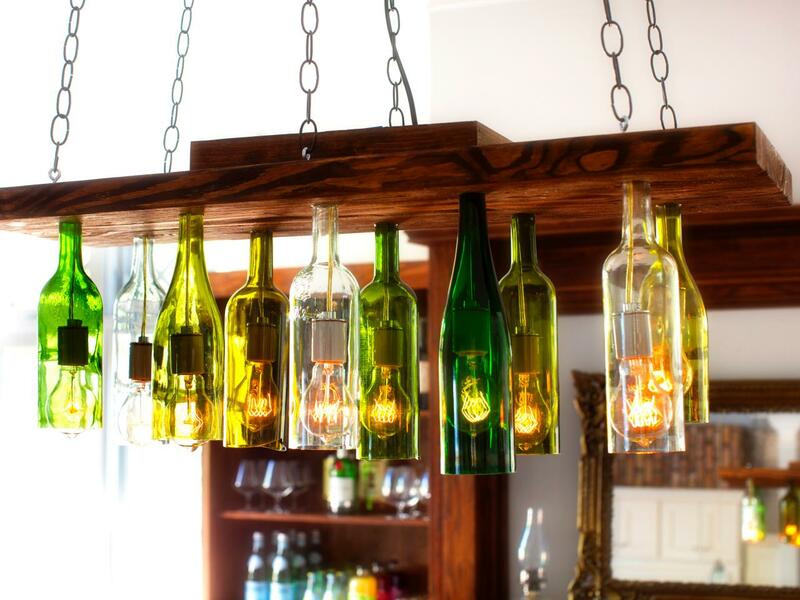 Collect an assortment of wine bottles of varying height and color and make your own customized chandelier for your home. 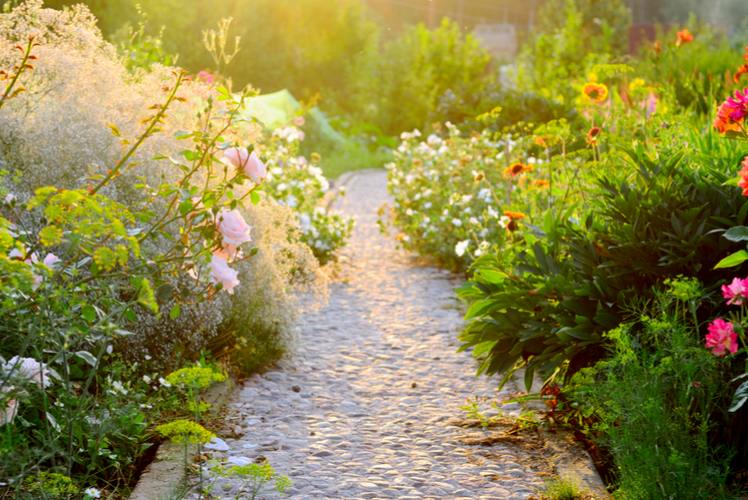 This wonderful creation requires a bit of effort, but the instructions to make it are easy to follow. 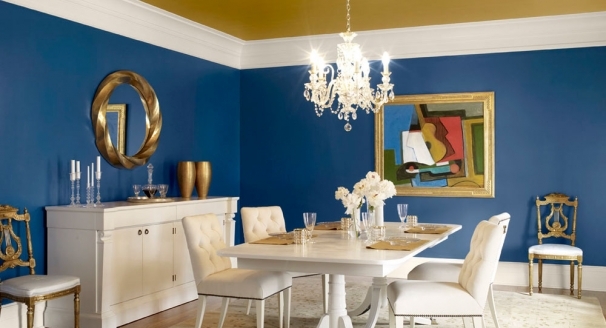 After completing it, the chandelier will look perfect in a bar, kitchen, dining room or cellar room. 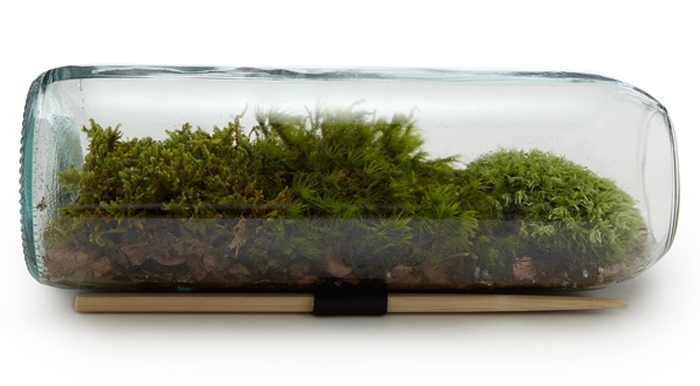 Bring the garden indoors, with a beautiful terrarium to display in your home. 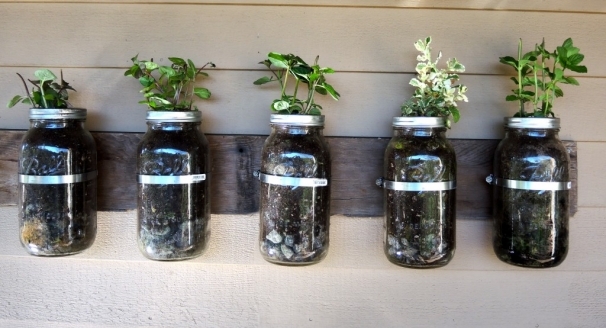 These are great if you live in an apartment or only have a small garden space, as you can still demonstrate your green thumb. Wine bottle terrariums are low maintenance and really easy to make, as all you need to do is cut the top off the bottle and place pretty little plants inside. You’ve probably seen wine bottles used as candle holders before in restaurants, as it is a simple way of creating some mood lighting. These are really easy to make and great to use when you are having guests over for dinner. Try and find pretty wine bottles with interesting labels for your candle holders, and light them before your guests arrive to create the dripped wax look. If you have a lot of books, consider storing them in a sturdy bookshelf made of wood and wine bottles. Compared to the cost of a bookshelf bought online or in a store, making one is really inexpensive. You might need a lot of bottles to put together this bookshelf depending on how tall you want it. You also need to make sure they are all the same height, so the shelves are all level and don’t tip on one side. 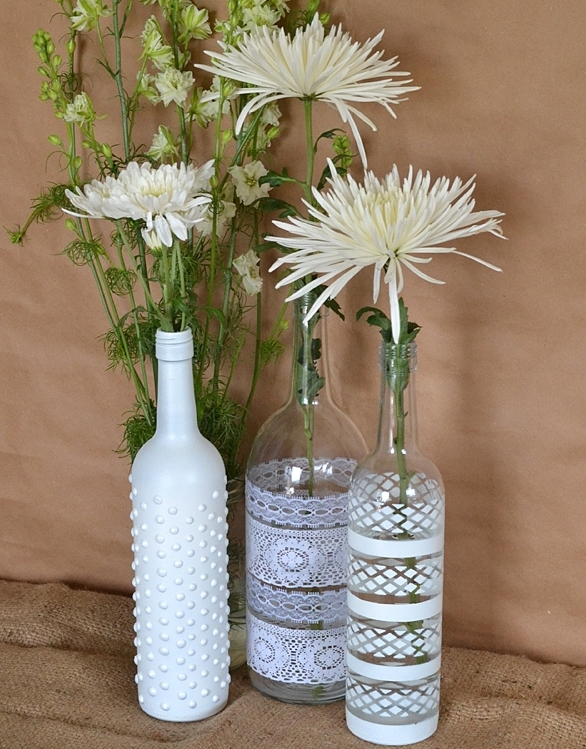 Instead of spending a fortune on vases for your home, display your beautiful flowers in a wine bottle that has been upcycled into a pretty and elegant vase. 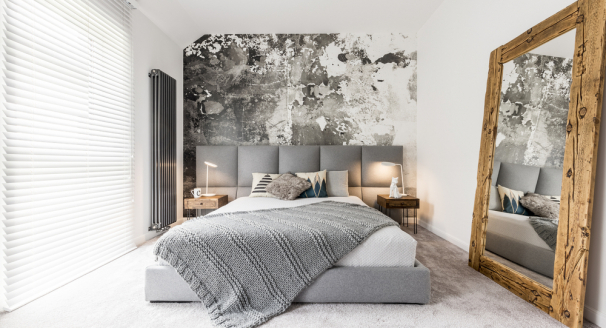 This boho inspired design is very understated and only requires white spray paint and few other materials such as lace, ribbon and stencils. Chalkboard paint is a brilliant invention as you can turn literally any object into a writeable chalkboard surface. 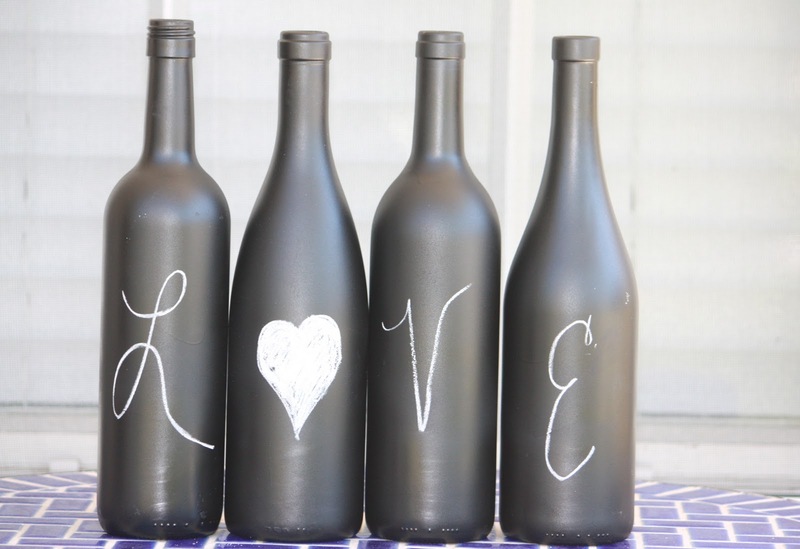 Partially or wholly paint your empty wine bottles with chalkboard paint and write different messages or labels on them with chalk. 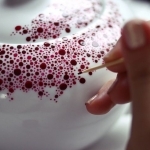 You can easily change what you have written as the paint creates a wipeable surface. Make a lovely new soap dispenser for your bathroom or kitchen using a clear wine bottle. 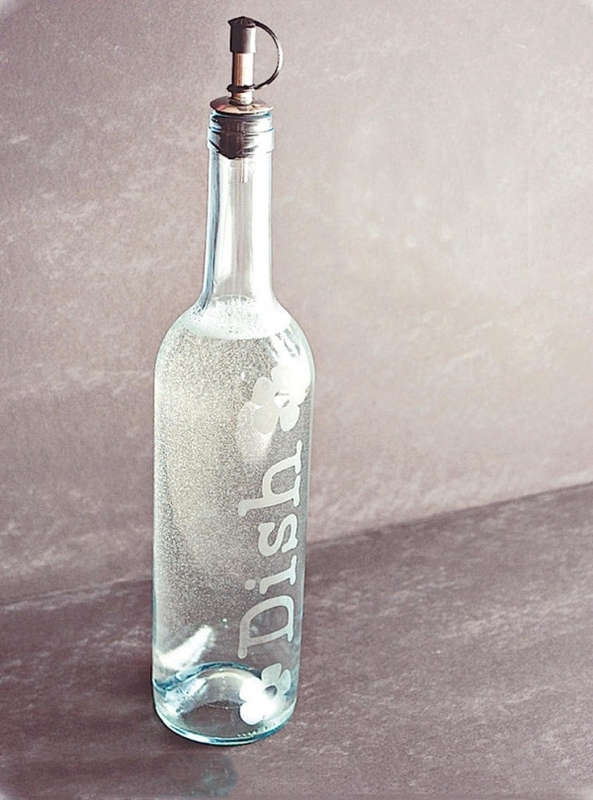 By having a bottle that is clear, you can see how much soap is left in the container and also etch a pretty design on the front like flowers or add a label for your soap dispenser. A good quality photo frame can be expensive so why not create your own using wine bottles. 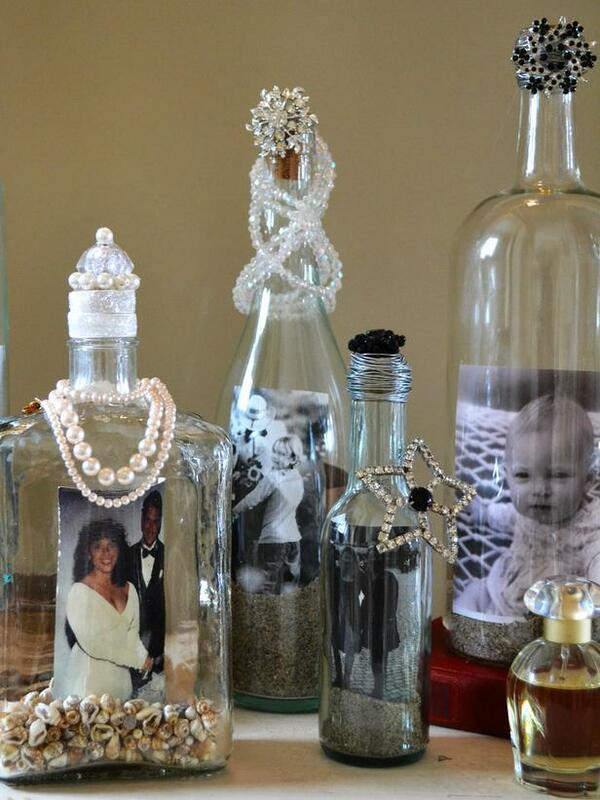 You need to have clear wine bottles so you can easily see the photograph displayed inside and a few decorative accessories. 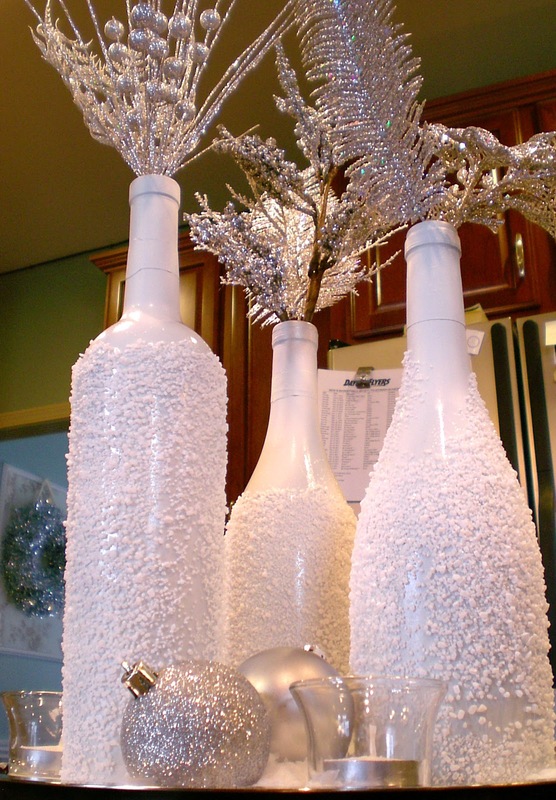 You can decorate your wine bottle however you want, but for this design you will require materials such as shells, pebbles, sand and corks. 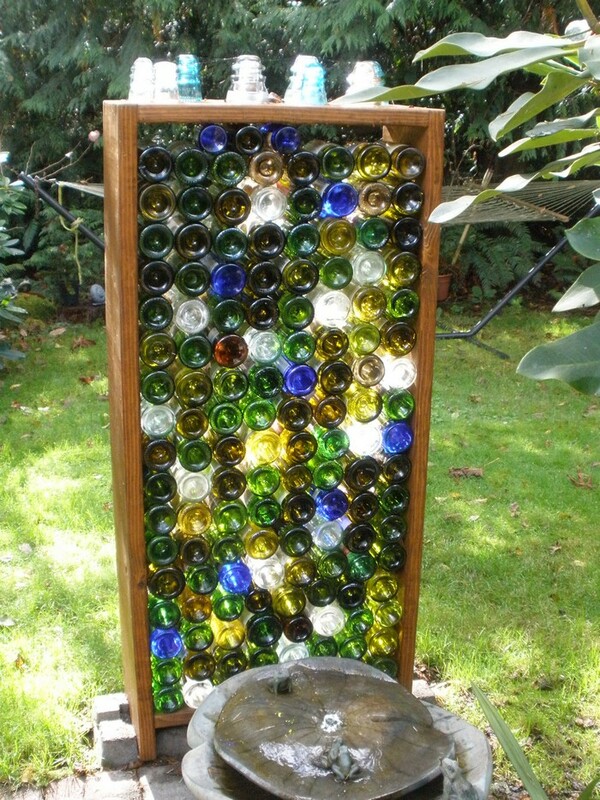 Make your outdoor area more private by building a screen out of empty wine bottles. Depending on how much wine you drink, you might need some help from friends and family to gather the right amount of bottles for a screen. When you are collecting them try to have a mix of colored bottles, as people will be able to see through clear bottles, which will make it less private. Enhance the look of your yard at night with homemade tiki torches. These are a great way to create a warm fiery glow when you are sat outside during the night time and are also useful for keeping bugs away. 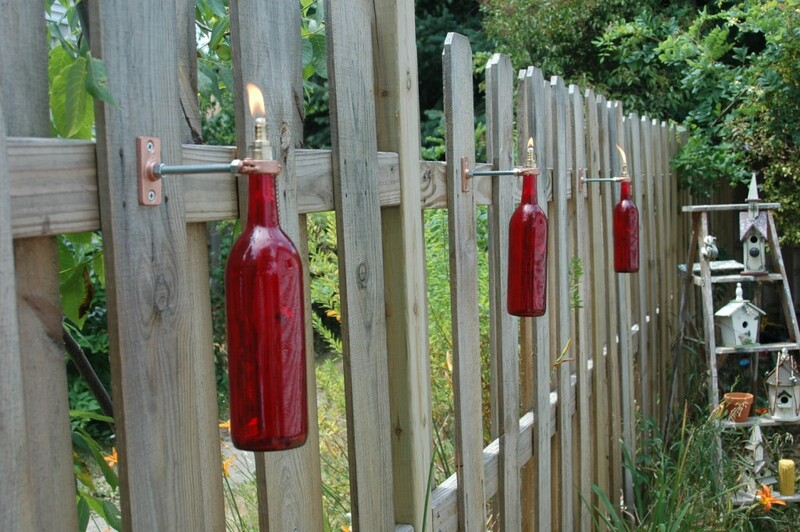 You only need to collect a couple of wine bottles to make tiki torches, and you can decorate them with any design you want. 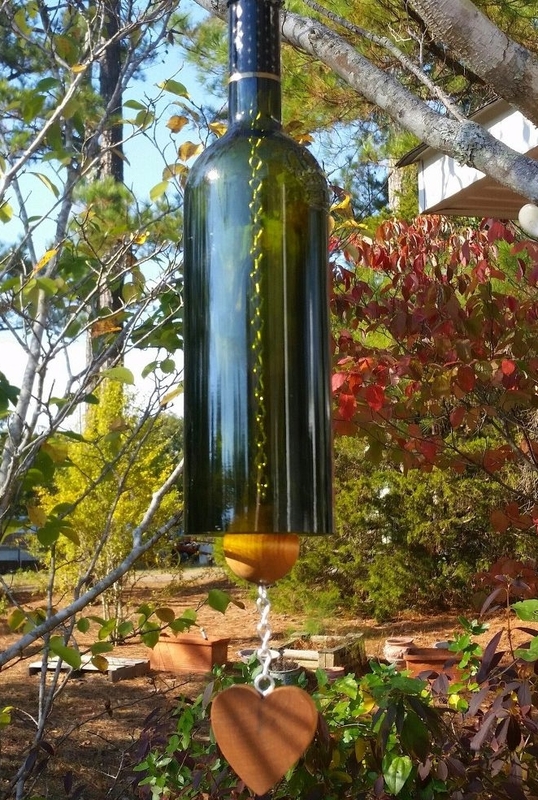 Transform a wine bottle into a beautiful wind chime to hang outside your home. You can use any size, thickness or color wine bottle, as they all produce different sounds. To make this particular wind chime you will need a range of materials as it features a pretty wooden knocker and wooden heart shaped wind catch. 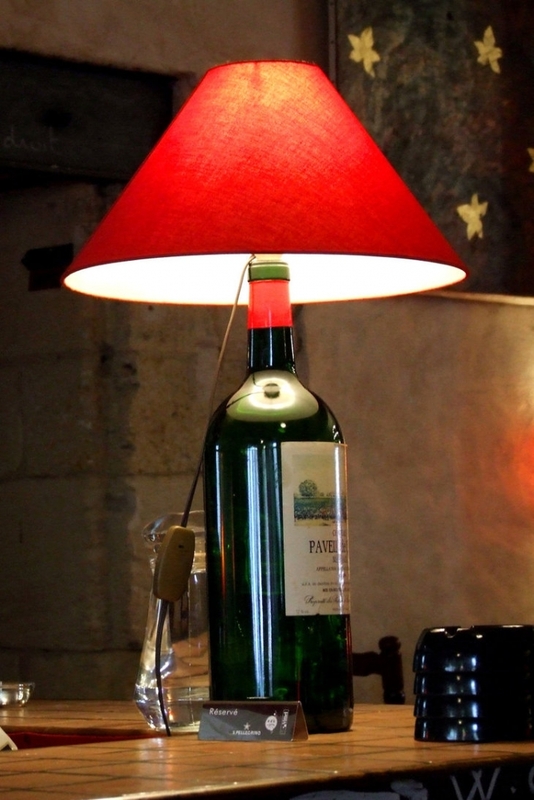 Instead of buying a generic lamp from the store you can accessorize your home with a DIY lamp made from a wine bottle. Surprisingly these are really easy to make, as once you have an empty wine bottle, all you need to do is purchase a lamp shade that you like and a cork stopper lamp kit. 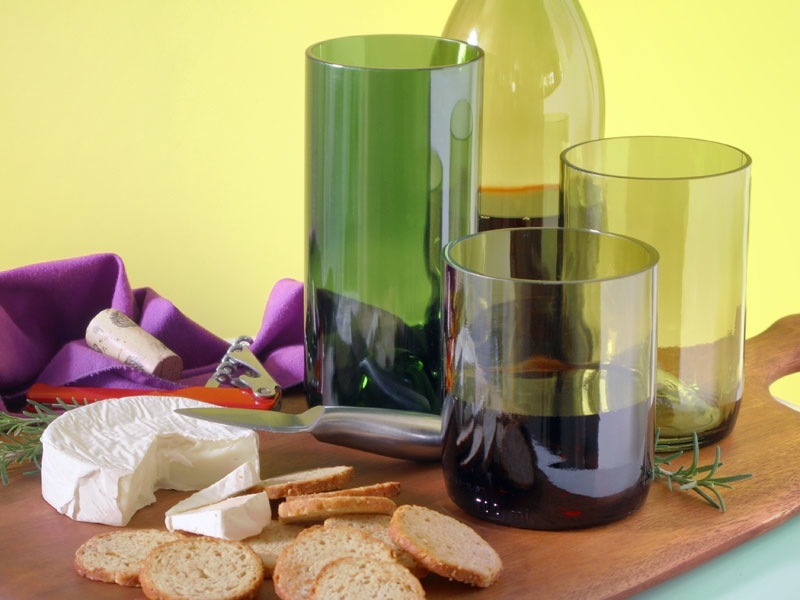 Turn your empty wine bottles into handy tumblers. 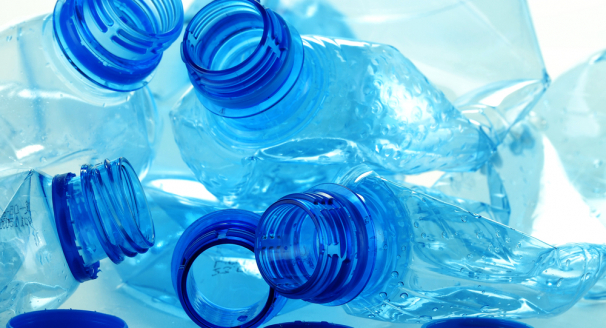 It’s a really simple process as you only need to cut off the top of the bottles to create a tumbler shape. Afterwards sand round the rim of the DIY tumblers to create a smooth edge. This way you won’t risk cutting your lip on the glass. This is a super simple way of creating a beautiful lamp that illuminates your home. 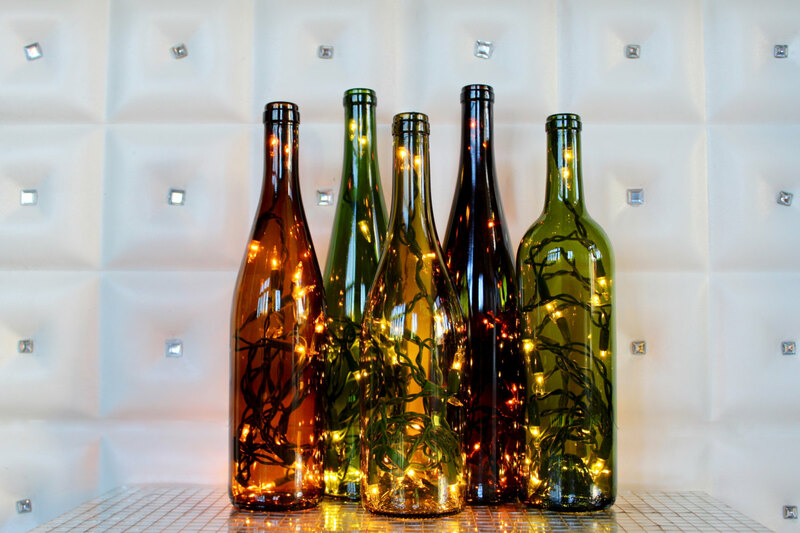 All you need to do is insert a string of lights inside a bottle and turn them on to create a gorgeous glow. This style of lamp is suitable for any room and can even be used as a centerpiece to light up any occasion. If you're catering for a dinner party or organizing a wedding, a set of table numbers can be an ideal decoration. 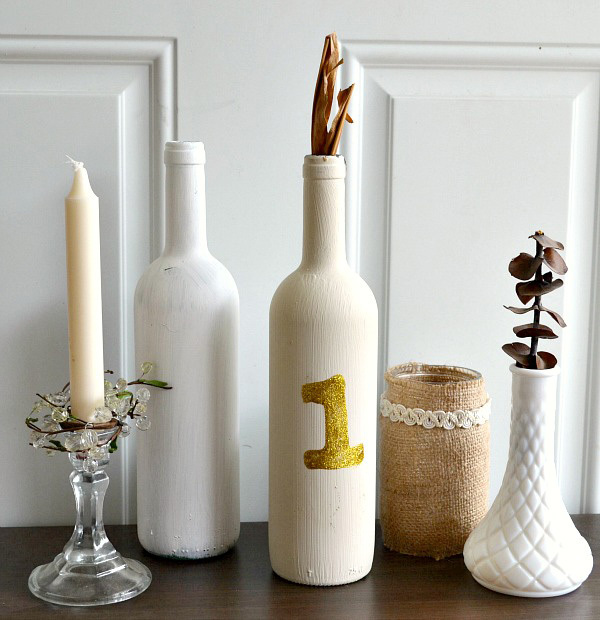 To impress your guests, consider upcycling wine bottles into elegant decorative table numbers. They are really easy to craft, because you just need to paint the bottle and then stencil and paint on the number in a different color. 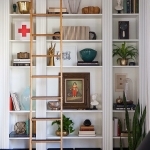 Stop misplacing jewelry and keep it all in one place with your very own jewelry display. 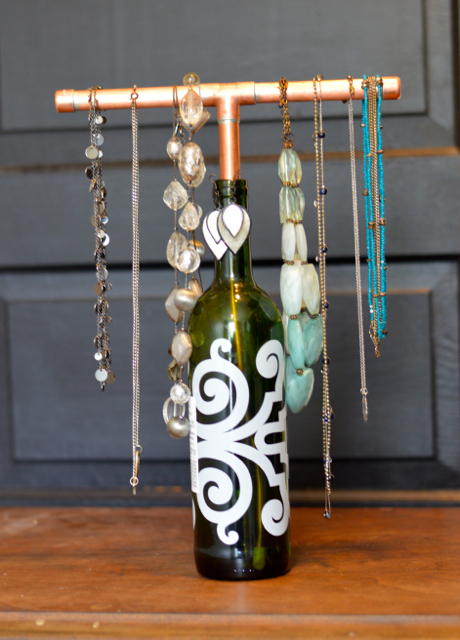 All you need is a wine bottle and scrap copper pipes to make this functional jewelry display. 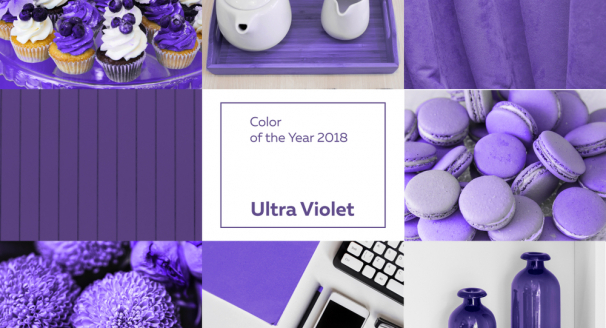 You can leave the wine bottle plain or decorate it to make it more visually appealing, and match the decor in your home. 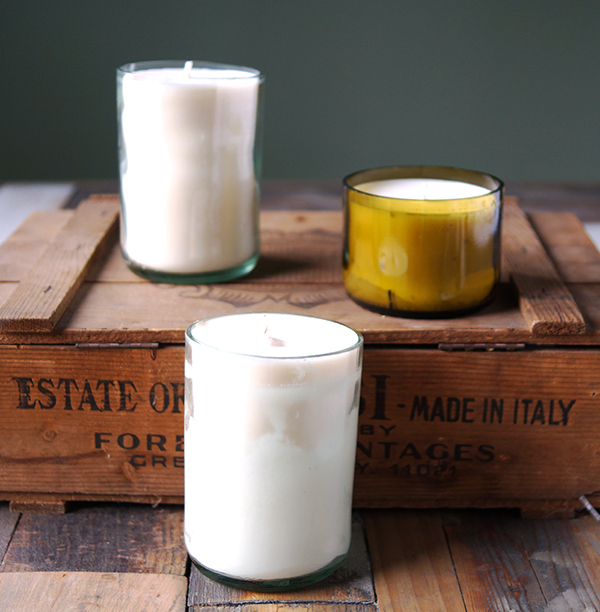 We’ve mentioned using wine bottles as candle holders, but did you know you can also use them to help create your own homemade candles? 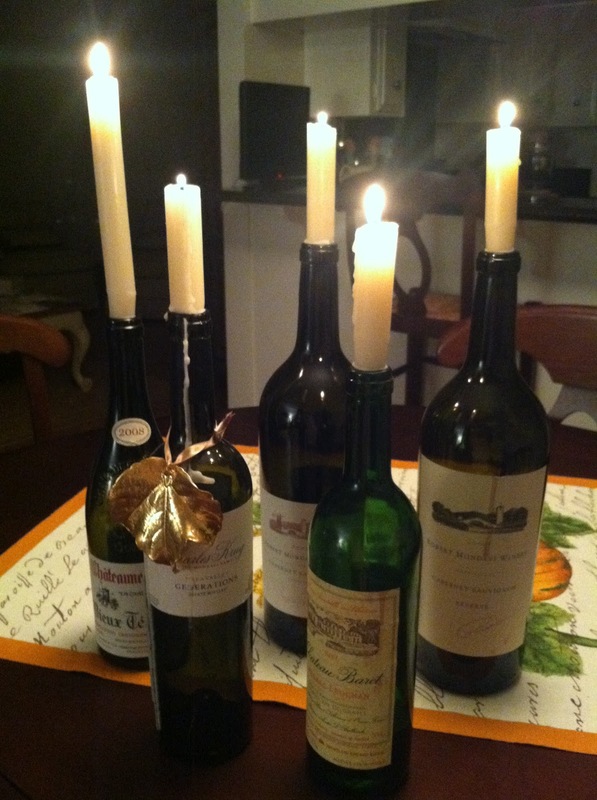 It can be easy just buying candles from the store, but if you have a few empty wine bottles around, you can use them as containers to make your very own candles. Just cut the top off the wine bottles and insert melted wax into them that is scented with your favorite fragrance. 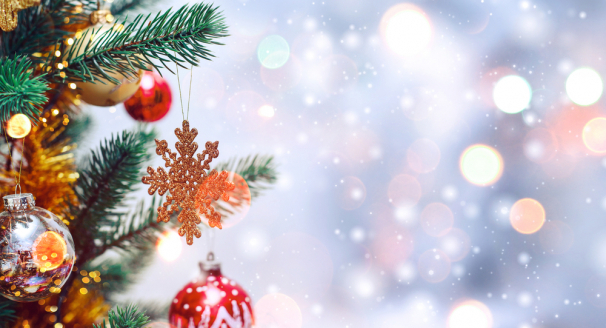 Make a beautiful winter centerpiece by decorating wine bottles with epsom salts to create a snowy effect. It's really easy to create this, and you can make it extra special by inserting silver decorations inside the bottle or even candles. 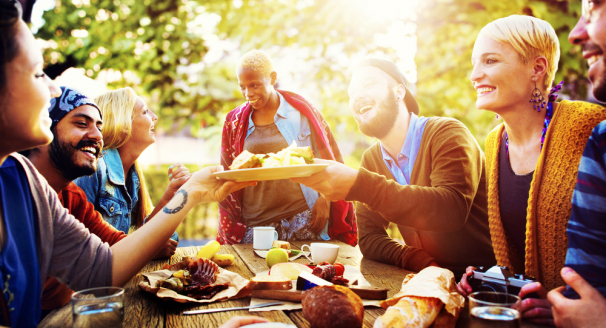 You won’t need to spend much money on this centerpiece and the result will look gorgeous in the middle of your table.